I did win. I am not reporting because of the lotto, I am reporting the foul language and running the clock down on purpose which happened after his/her lotto failed. Player 12 has been banned and should no longer trouble players. Should you suspect having run into him on another name, please report it. Report for player edberg55, who is almost definitely the previously banned benzema465. Essentially identical abuse + Spanish flag. Unless "son of a big ♥♥♥♥♥" is a standard conversation starter in Spain. I can't help but doubt that's the case though. We will open a case. I just ran into edberg55. Disgusting language. Having issues attaching file again but I have a screenshot I could email with some very nasty language if you need any more evidence. edberg55 is an alias of a permanently banned player so will also be banned. Reporting edberg55 for abusive behavior. edberg55 will be banned as he is an alias of an already banned player. Addition to Mathuielawrence. I played BudTugley who stole 25 minutes of my time with stalling 15 seconds per move. Move timer has to change to 4 seconds. Punishment needs to be enforced from Moderating team, this is bs. BudTugley is a pathetic player. I have video of his crap that I can upload if needed you support your case. When he knew that he had lost, he requested pauses and ties. The MT has decided that BudTugley will have his rating reduced by 100 and will be sent a newly implemented letter; a poor sportsmanship letter. This letter will be used for cases where it behavior is deemed undesired, but does not, yet, warrant for an abusive behavior penalty right away (for example the rules do not foresee in the offense). I am not for banning players as the amount of players is very low, but for players such as Budtugley and Matthieulawrence any thing less than a ban is insulting to all the legit players. None the less thank you MT for taking some sort of action on this case and now future ones. Me neither. If anything, it hurts the player pool. Sometimes, it'll have to be done, though, as some levels of toxicity are just unacceptable. As for ML who has one (lightly judged) offense, I don't think you'd actually like to see him banned for that. Dear Management team, Jookiyaya calls me a stupid cheater publicly, without giving any prove. He has done that very often already to others. Did you take any action against him so far? I ask you to send him a warning letter, deduct 100 points for abusive behavior and delete his post in the General forum immediately. I suggest to bann this player pemanently if he calls innocent people a stupid looses, or at least bann him from the forum. I am sure that the MT will have come up with a good play for such complaints. Edited by KissMyCookie, 16 June 2018 - 05:36 PM. The post was hidden and the member in question has been properly warned in private. Another question. I had a strang experience with yourbiggestfan. The details of his showed 957 Elo points having played just 13 games, 10 won, 3 loss, 0 draw. How can that be at all? I understand that he is unladden swallow. He claimed that he is a hacker and can see my screen setting (was a bit weired). Before I could make a copy of the conversation, my system broke (or someone broke it, hacker?) and the game was a win for him without having started to play. 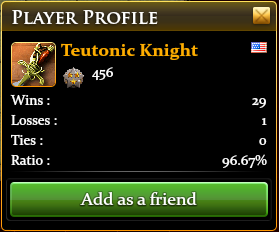 So the question is: How can someone have an Elo of 957 having played only 13 games? And I thought that this account is no longer active at least not in the forum? I am reporting SULA. Started the abusive chat in the setup phase. As you can see, I am taking the advice of a player who's name escapes me. He replies to abusive chat with gibberish. I find this sort of therapeutic.